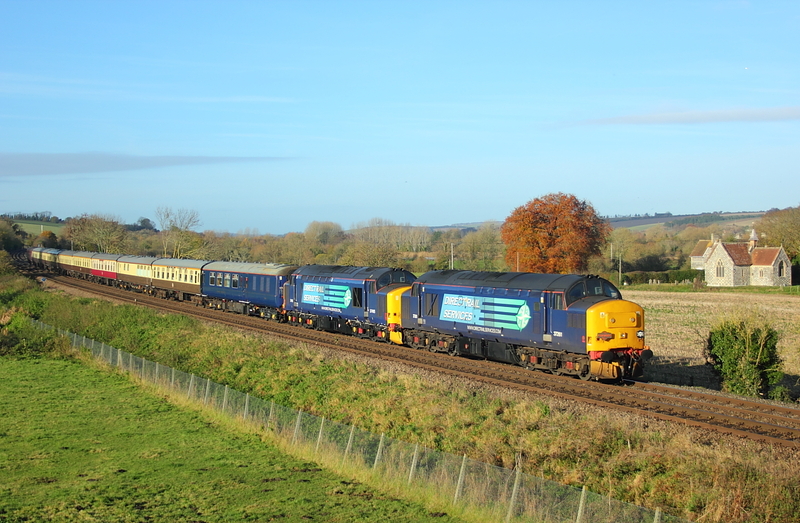 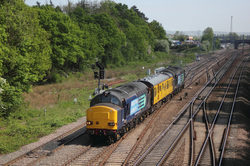 ​ 37175 top and 37254 tailing on 1Q51 Derby RTC to Eastleigh works test train via Weymouth. 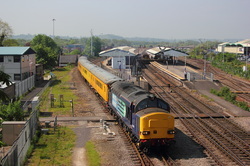 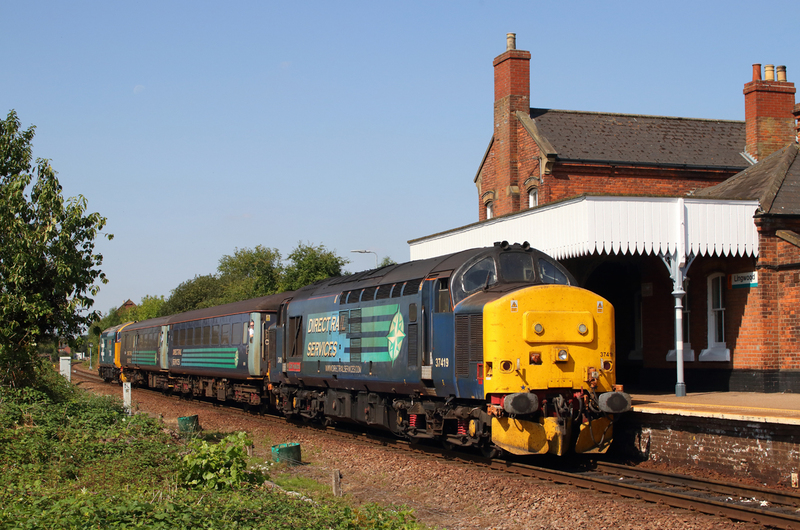 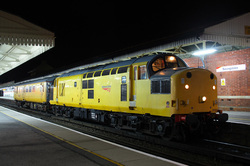 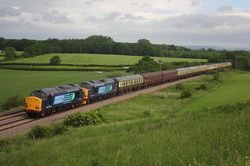 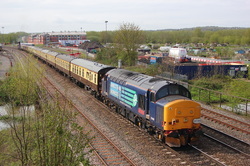 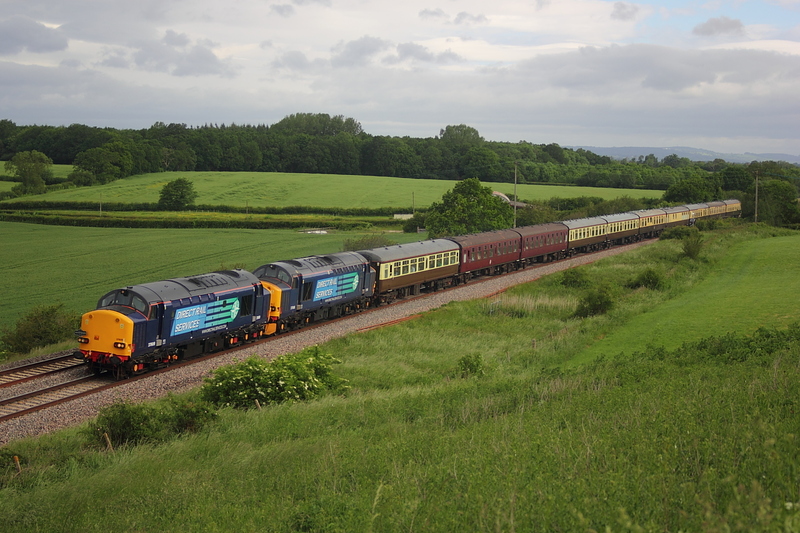 37884 + 350261 5Q94 Northampton E.M.D. 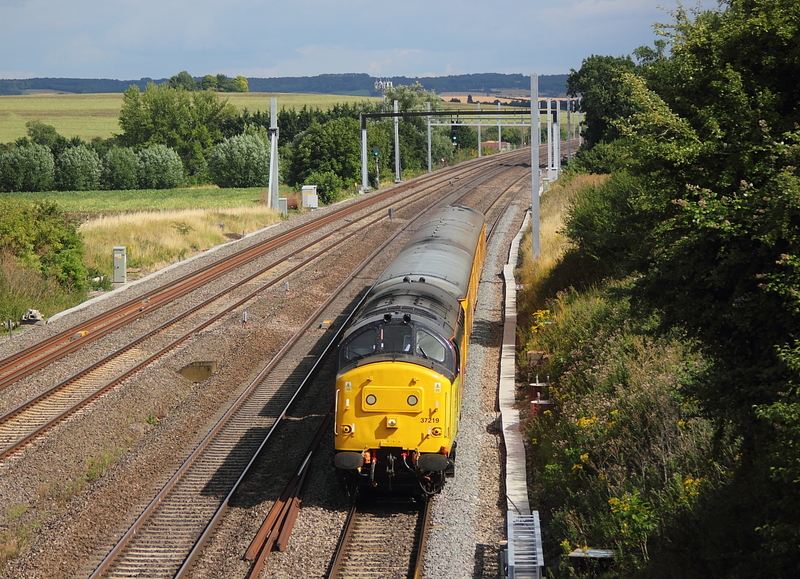 to Long Marston. 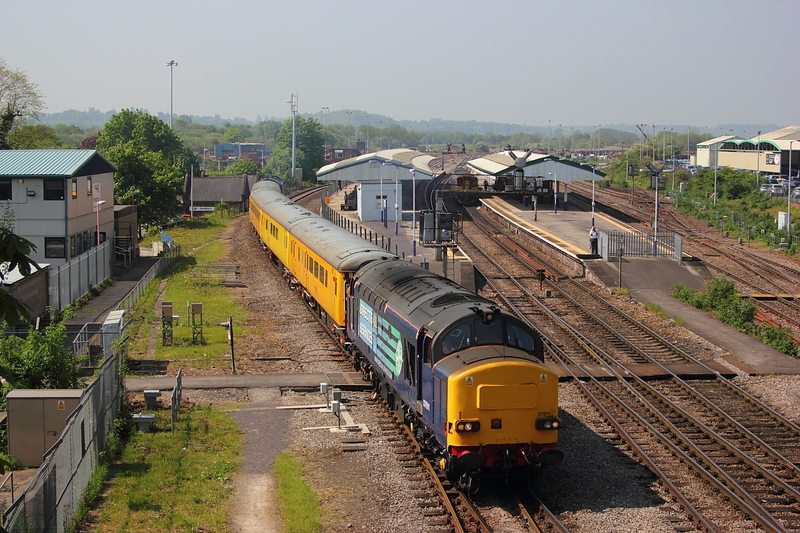 37254"Cardiff Canton"+ 37175 sit at Carmarthen station having arrived on 1Z56 05.35 from Carnforth with the Branch Line Society 565 special. 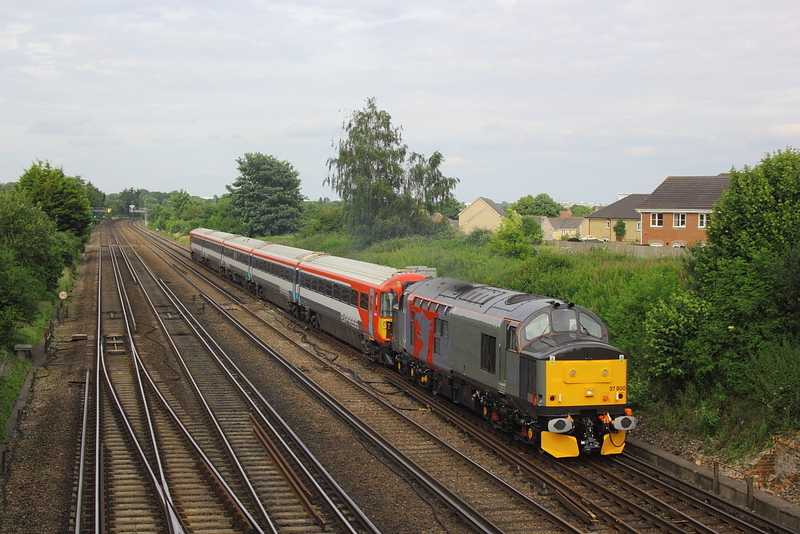 To be fair it was never going to be full sun with the area mostly cloudy,but has often the coast promised at least potential watery sun but having rounded the bend in reasonable sun,the luck ran out at the crucial time as 37175 Top and 37254"Cardiff Canton" tailing on 1Z65 14.45 Carmarthen to Carnforth ,the returning Branch line Society tour. 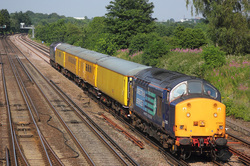 37116 t &37057 t on 1Q53 Eastleigh Arlington to Eastleigh Arlington test train. 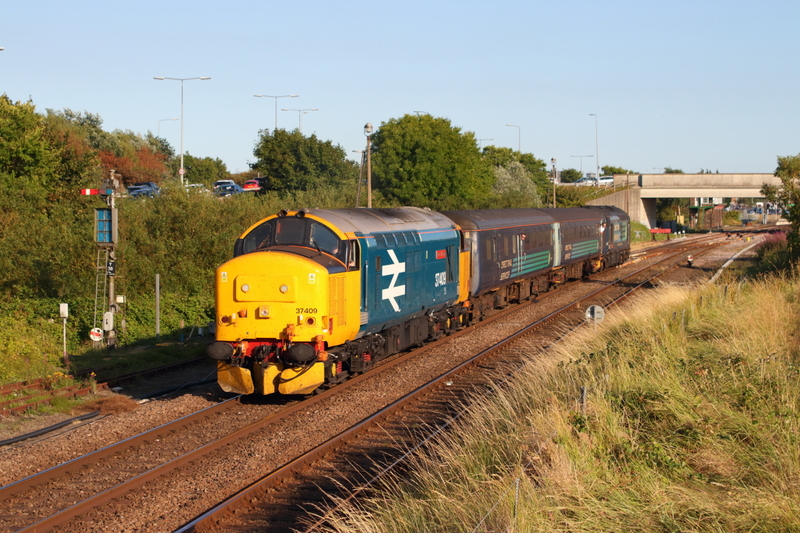 37800+375903 5Q58 04.40 Derby Litchurch Lane to Ramsgate E.M.U.D. 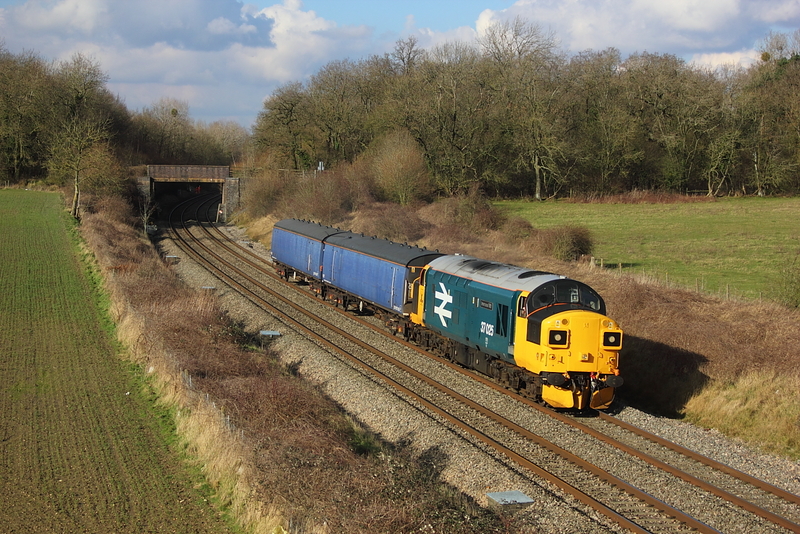 Running 15minutes early at Old Linslade ,R.O.G.s 37800 +375712 passes in what would probably be the last bit of sunshine before the forcasted cloud drifted even further south,working 5Q58 04.40 Derby Litchurch lane to Ramsgate E.M.U.D.,and makes a change to walk back to the car and drive home under a cloudy sky as usually its the other way round. 37609+37606 1Z10 05.57 Eastleigh to Stockport "The Cheshire Cat" railtour,and I was grinning like the cat, has coming under the bridge in the background the cloud that had killed the early morning sunshine had still not fully cleared. 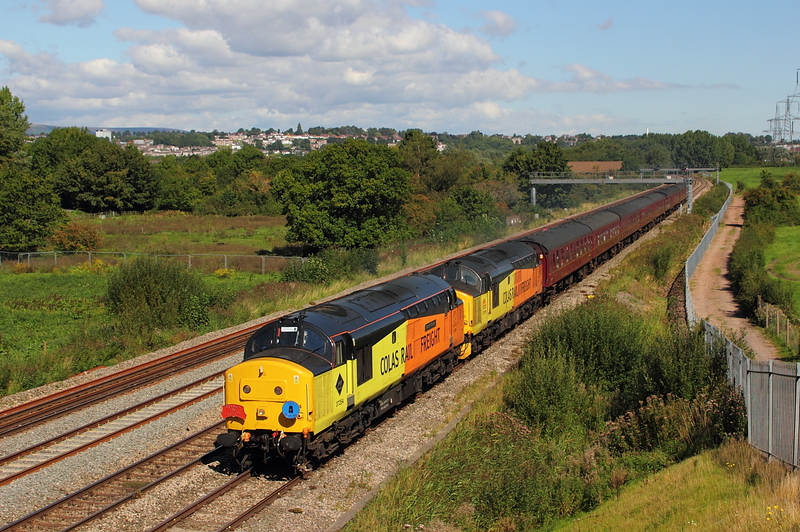 With seemingly everyman and his dog out for Colas hire in 37025"Inverness TMD" ON 5V37 Washwood Heath to Barry with two ex motorail vans in tow(for Colas driver training purposes)...it would be nail biting time as a huge black slow moving cloud in a mainly blue sky edged ever nearer to the thing that everyone strives to get there shots illuminated by,and running early helped the situation as shortly after everyone had a sigh of relief ,the black cloud did its worse. 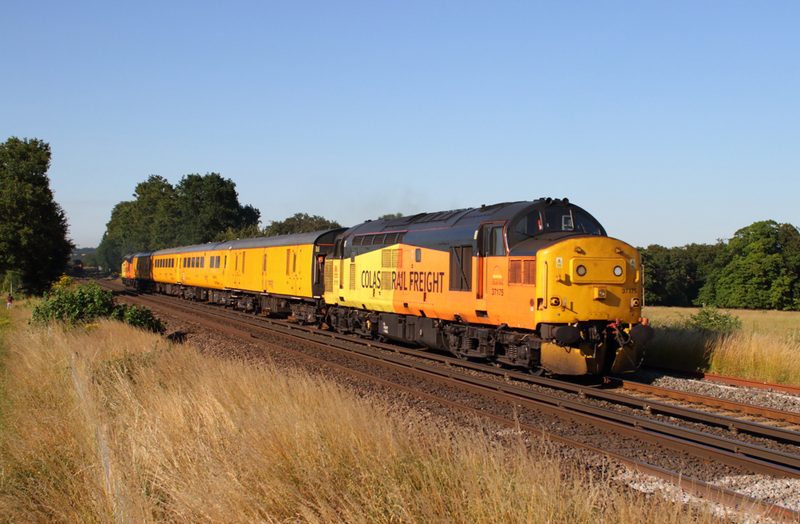 With the Colas driver training trying its best to piss most people of by either running short of its destination or running light,however today 37025"Inverness TMD" although running as 0M37 was actually on its way from Barry to Washwood Heath where it would return with two ex motorail vans presumably for the driver training runs. 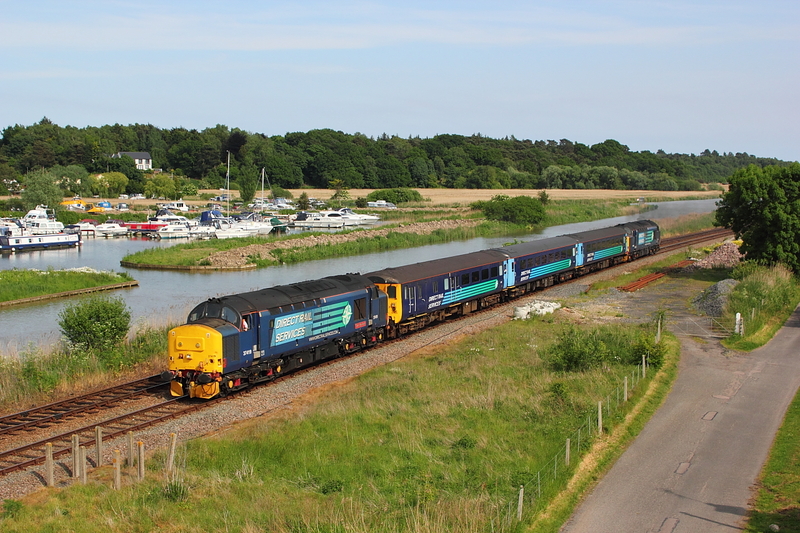 GUTTED...best describes this shot,as having amongst others stood under sunny skies for over an hour awaiting 37025"Inverness TMD" on the Colas driver training special only to witness a small floater do its deed in obscuring the sun at the crucial time as the 4B20 Barry to Barry passed by,then to rub salt in the wound,it came back out as the 37 approached the next bridge a short distance away.Not only that instead of continuing to run round at Swindon it did this instead at Bristol Parkway scuppering plans for a return shot over the bridge in what look better sunny conditions,then what looked as an enspired gamble at Magor the 37 was looped at Pilning for no sensible reason,so instead of continuing on the main in the sun it later turned up on the relief in the crap due to units using the main. 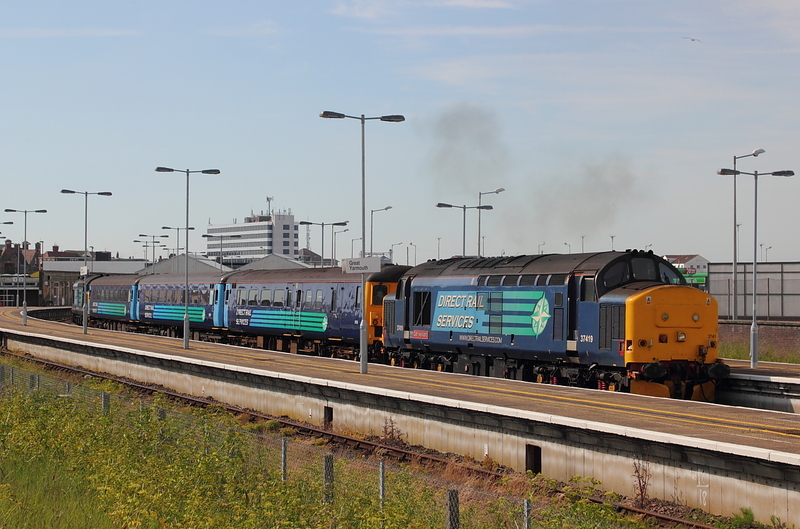 37175 Propelling DBSO 9708 on 3Z01 10.15 Cardiff Canton to Swansea ,via Reading West. 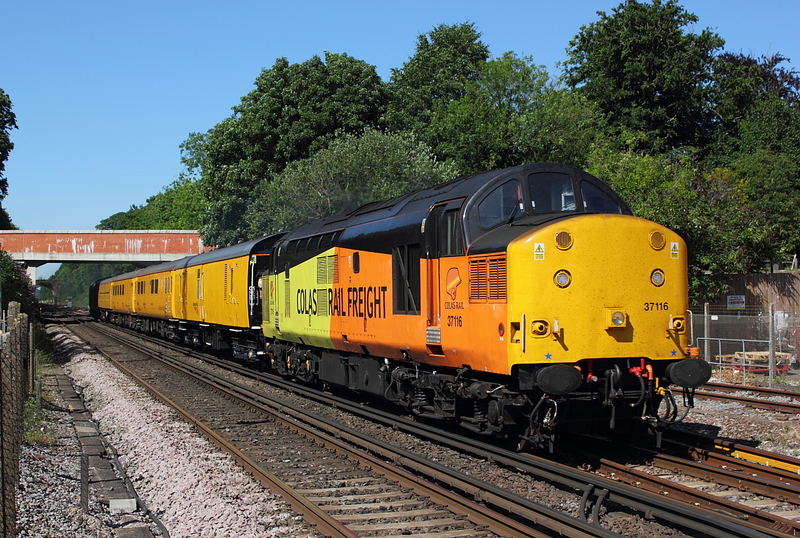 37401"Mary Queen of Scots"+37405 pull away from Eastleigh station with 1Z37 06.17 Chester to Bournemouth,The Bournemouth Flyer,in connection with the Bournemouth air show. 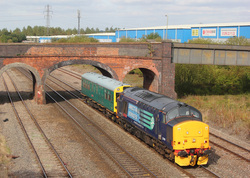 97304"John Tiley+97302 0Z97 Bescot TMD to Derby RTC,passing 66099 in the loop with the Kingsbury bound loaded tanks. 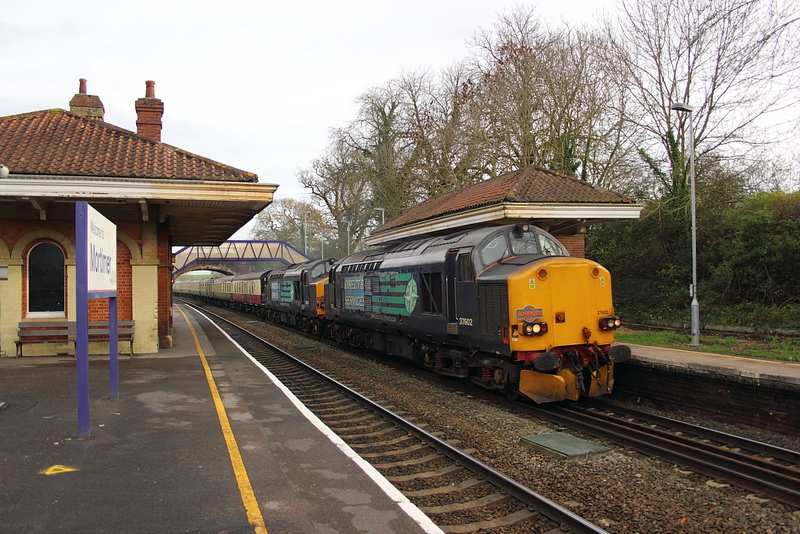 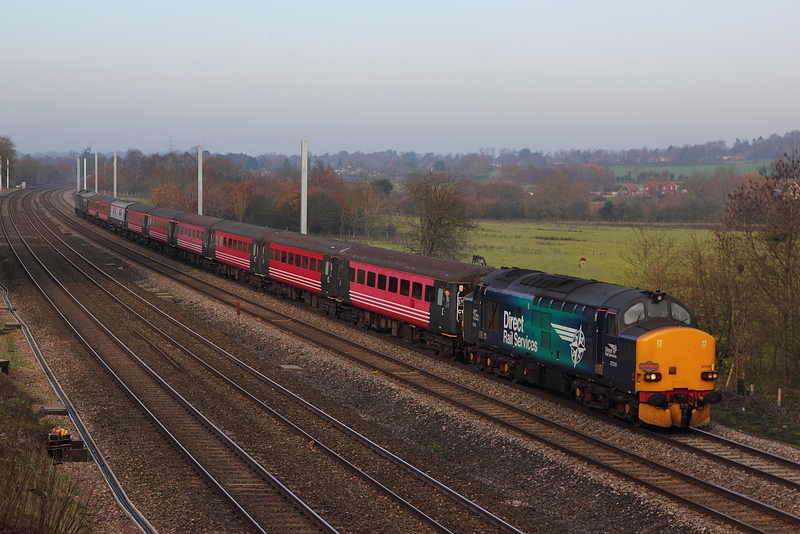 37261+37405,1z42,06.01 Whitchurch(Shropshire) to Portsmouth Harbour,"The Festive Festival Express" railtour. 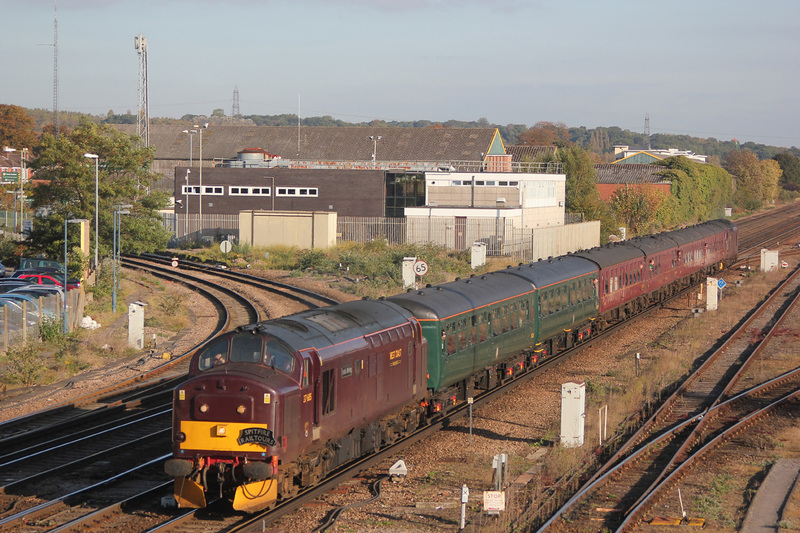 37402 Propelling inspection saloon"Caroline2 passes on 2Z02,13.25 Weymouth to Clapham Jnct. 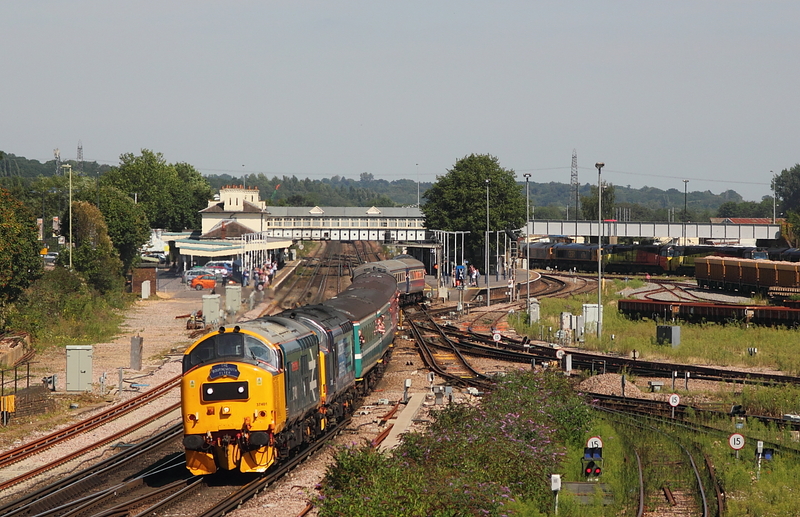 via Westbury,Warminster and Reading. 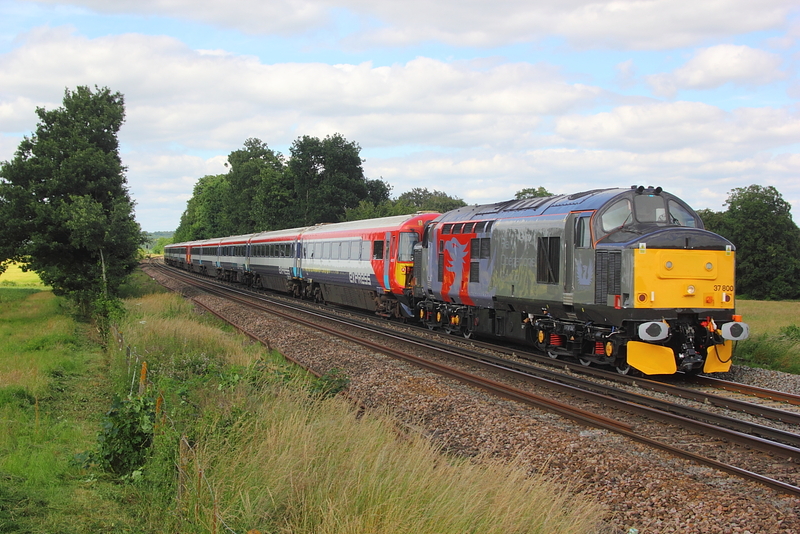 Having been held near Andover(probably due to the ED requiring a run round at Basingstoke as well) 1Q13 Eastleigh to Derby RTC test train,via everywhere was late ,and having presumably having left out the Basingstoke to Eastleigh to Basingstoke section,was seen passing Worting Jnct.with 37603 leading and 37604 on the rear,back on time,heading to Andover ,Romsey ,Eastleigh and back via Basingstoke to Derby RTC. 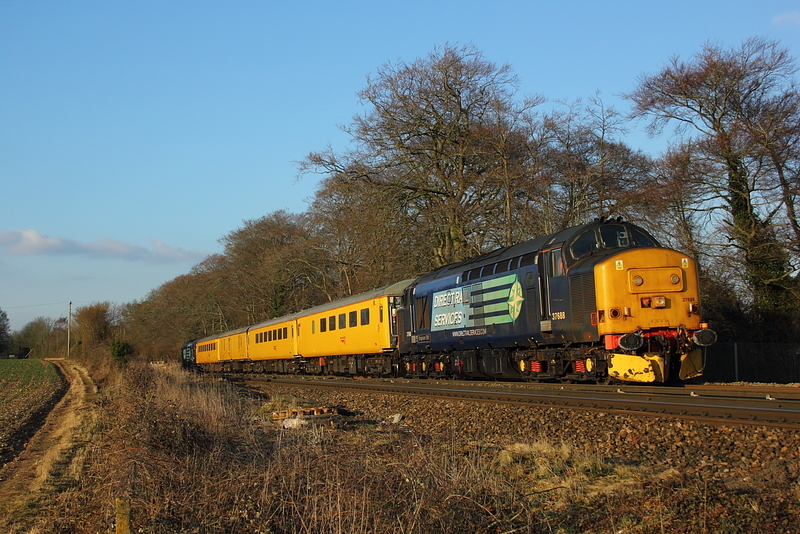 Running only a few minutes behind 67019 on a ECS,37259+RSC3(MK2)+2 Barrier coaches+37038,just about pass Battledown before the sun was going to dissapear bigtime,whilst working a Sunday 1Q14..09.51 Derby RTC to Eastleigh Alstom Works,ready for to its weekday turns. 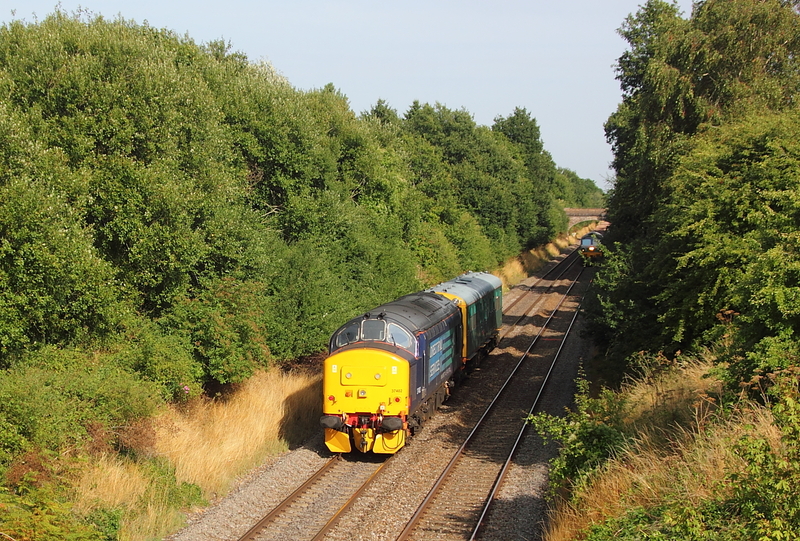 The forcasted clearance ,to be fair did happen later in the day,but if the BBC forcast timings had been accurate,then DRS 37609+37606 passing Damery on 1Z20,05.37 Crewe to Parkandillack would have been in sunny conditions,but as you can see this was not to be,as the tractors passed under cloud cover on thir way to the Duchy on the 3-2-c railtour. 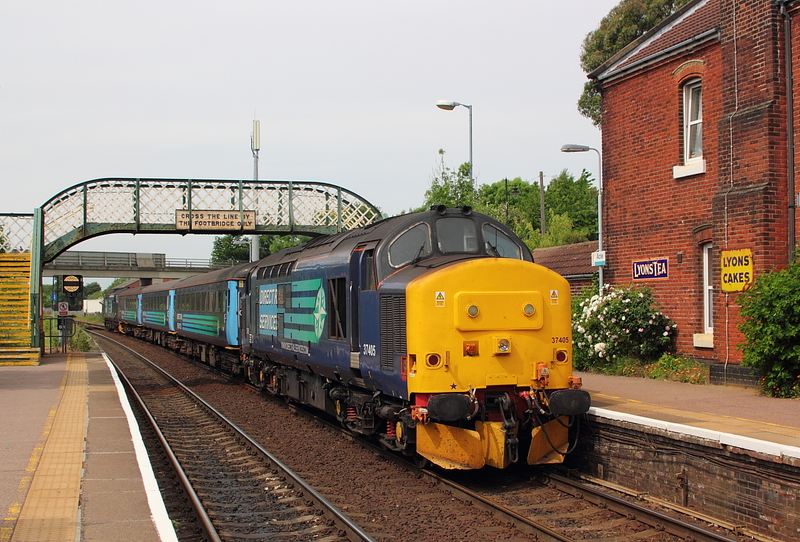 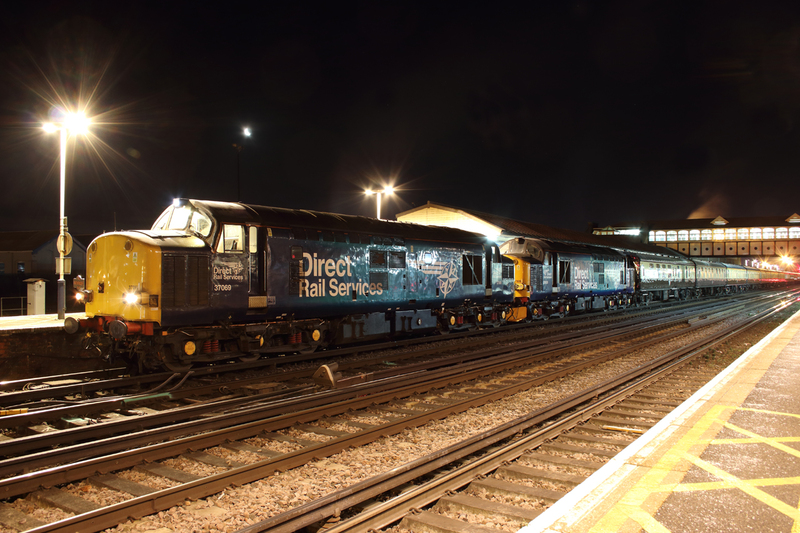 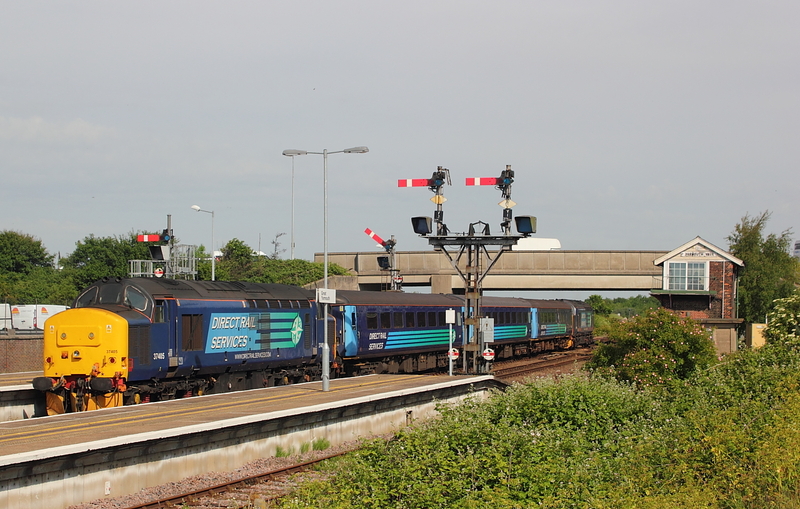 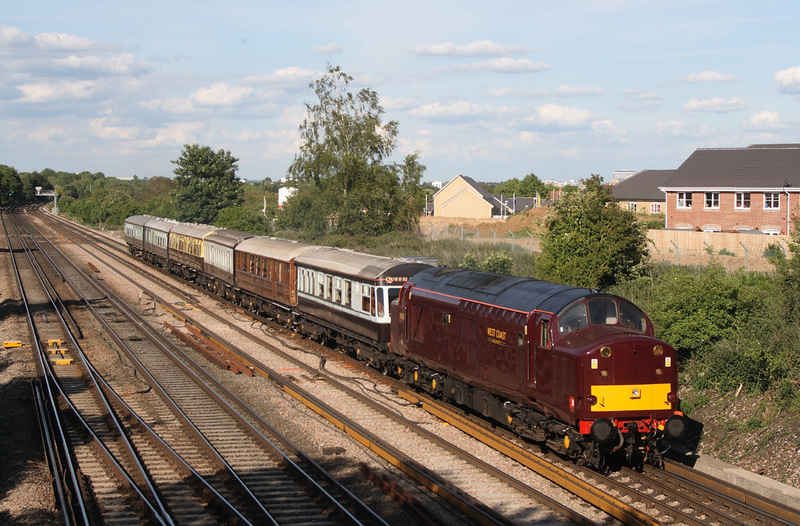 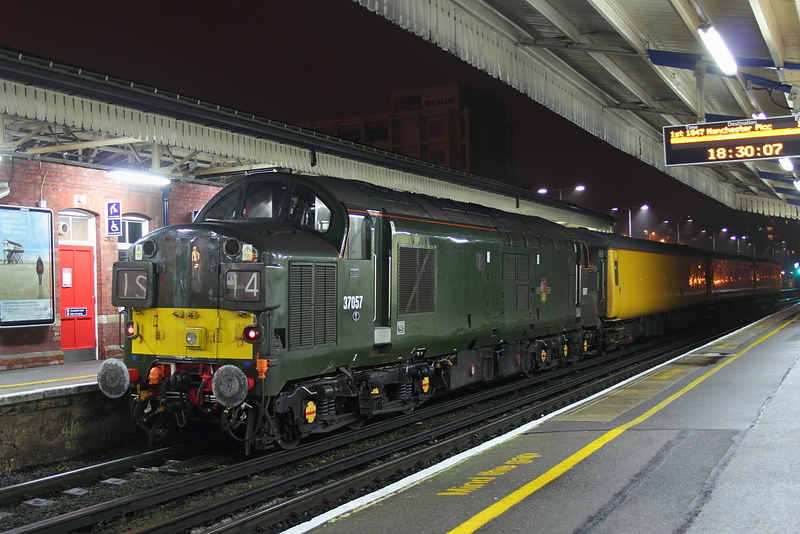 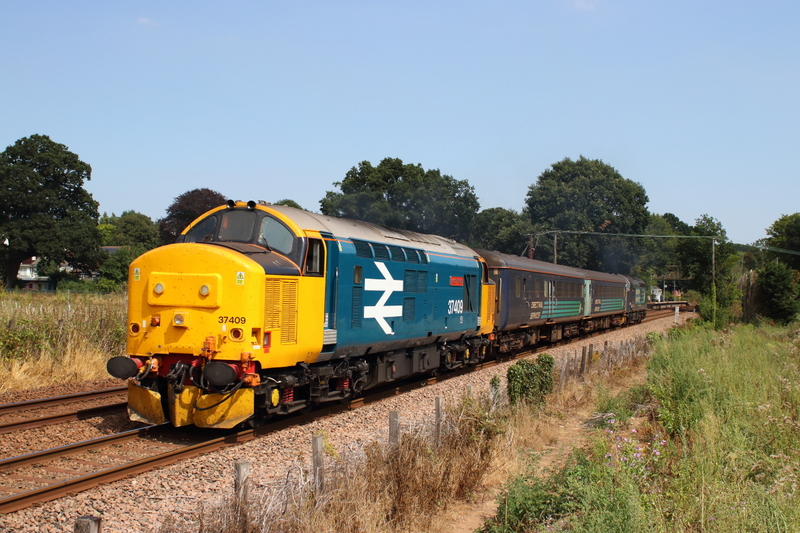 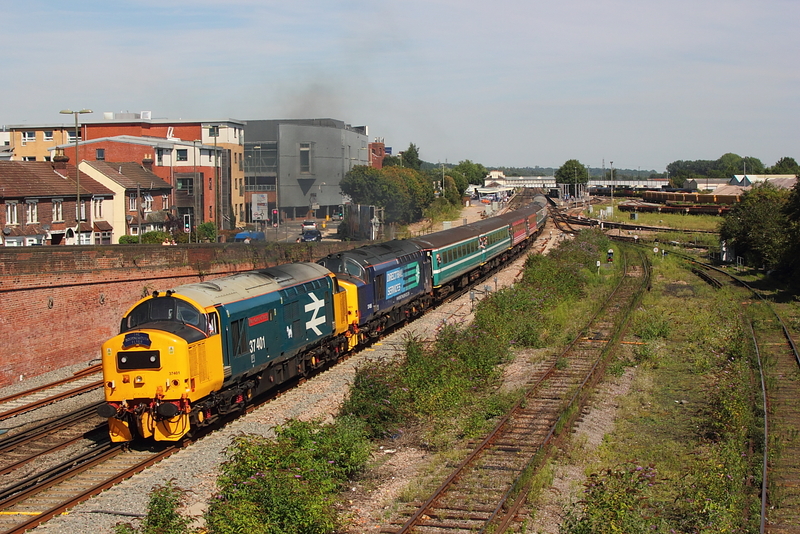 37685"Loch Arkaig"leading(37706 on the rear) on 1Z37..07.09 London Paddington to Portsmouth Harbour,Spitfire Tour's,Routes and Branches 111,railtour,seen here heading to Hamworthy. 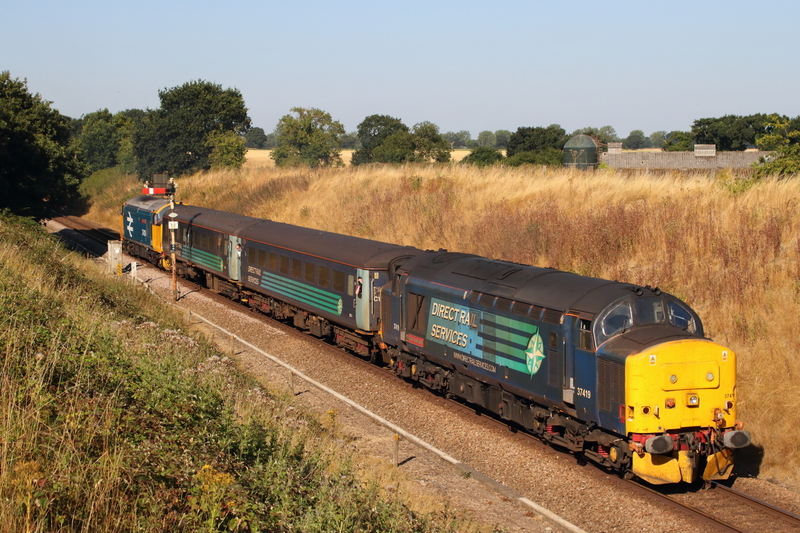 6M20 just gets out of the way in time on ecx RMC hoppers. 27/04/11 Didcot Parkway..37069+DB999508+37611..2Q88 Didcot to S.T.Jnct to Didcot. 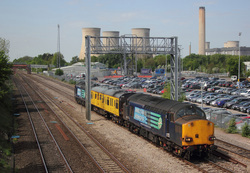 27/04/11 Didcot ..37611+DB999508+37069..2Q88 Didcot to Banbury. 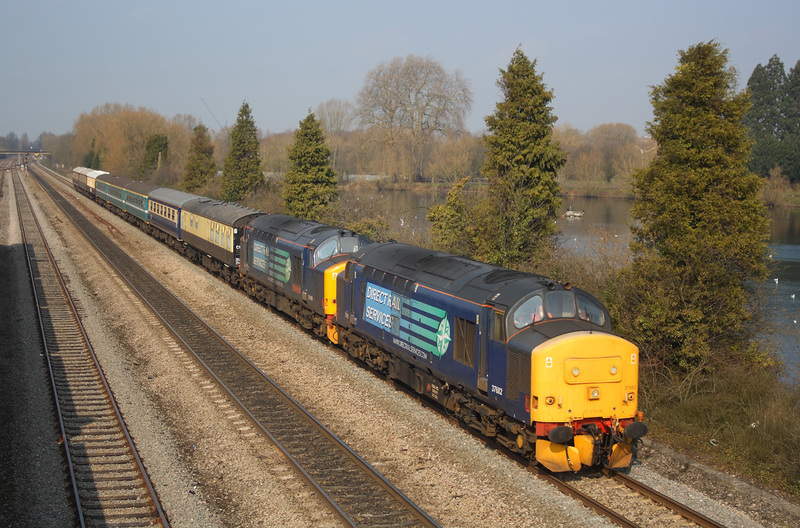 08/03/11 Hinksey..37682+37409"Lord Hinton"5z47..07.45 Crewe to Eastleigh ECS running approx.100 minutes late ,hence a location change. 37503 passing through Corfe common on 1H07,12.50 Norden to Harmans Cross. 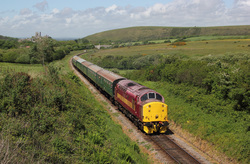 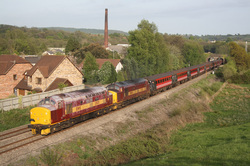 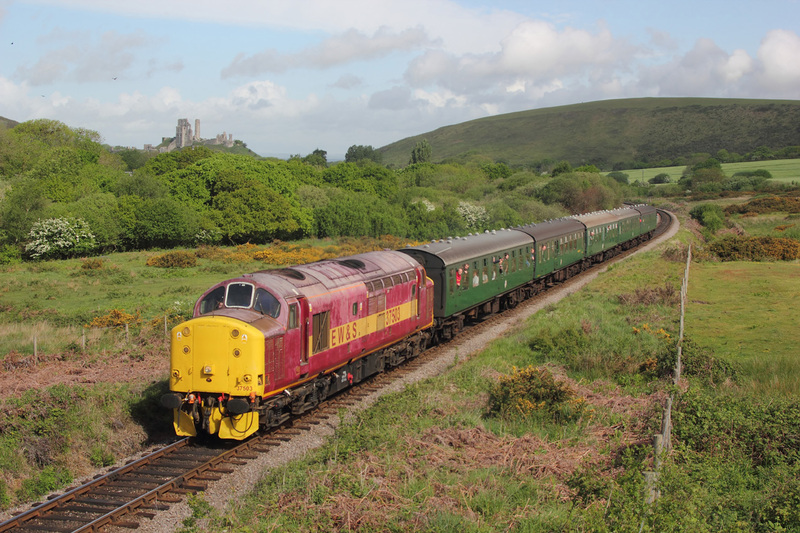 08/05/11 Swanage Railways Diesel Gala,Corfe common. 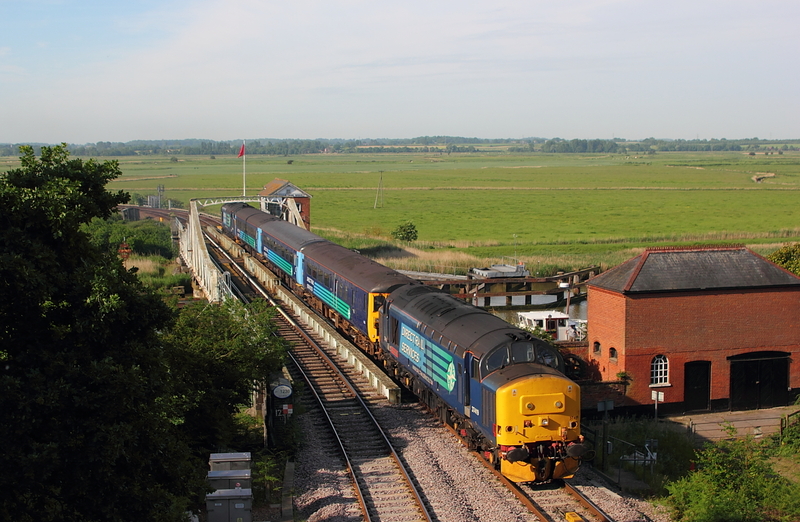 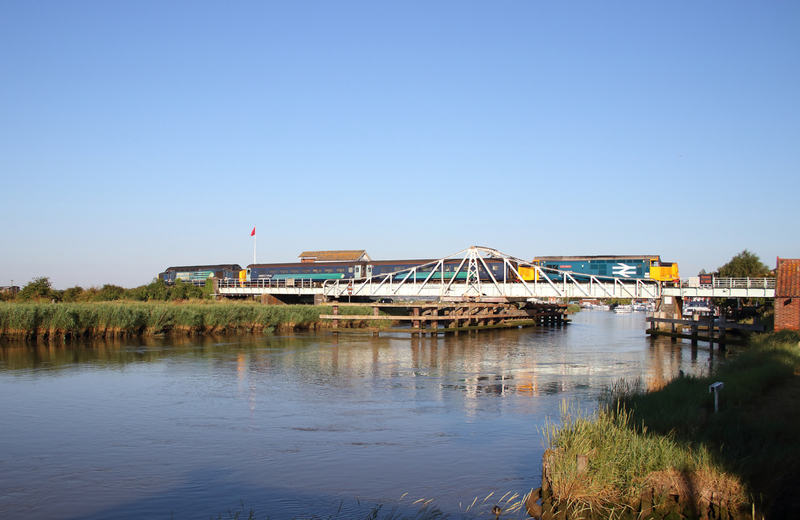 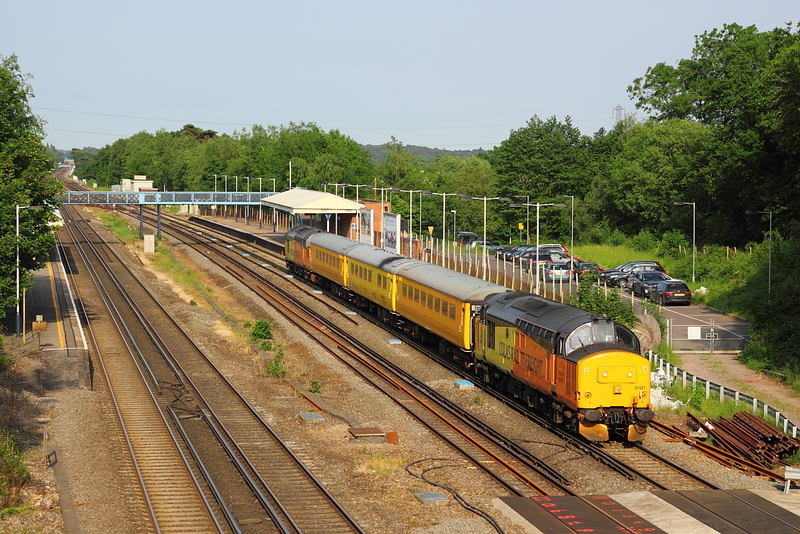 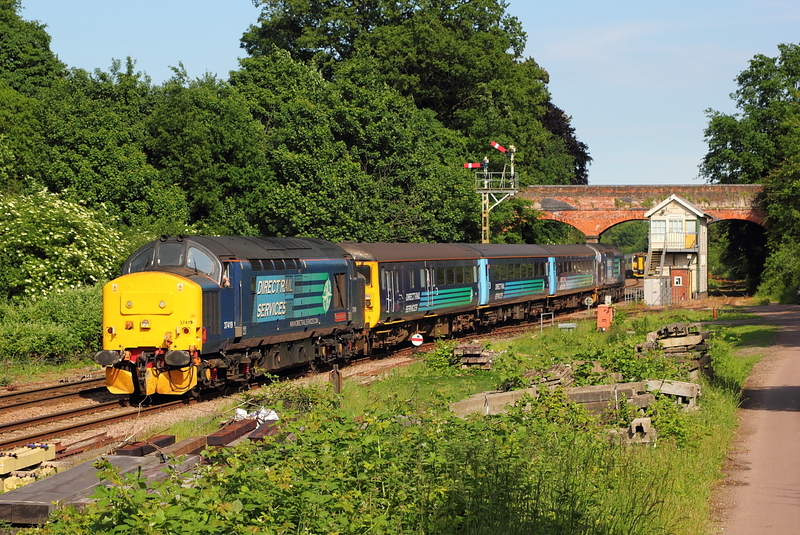 West Coast Railway's pairing off 37706+37516 pass the gallery on Cambell Road bridge ,Eastleigh on 1Z49,06.04 Crewe to Swanage,the "Purbeck Growler" railtour. 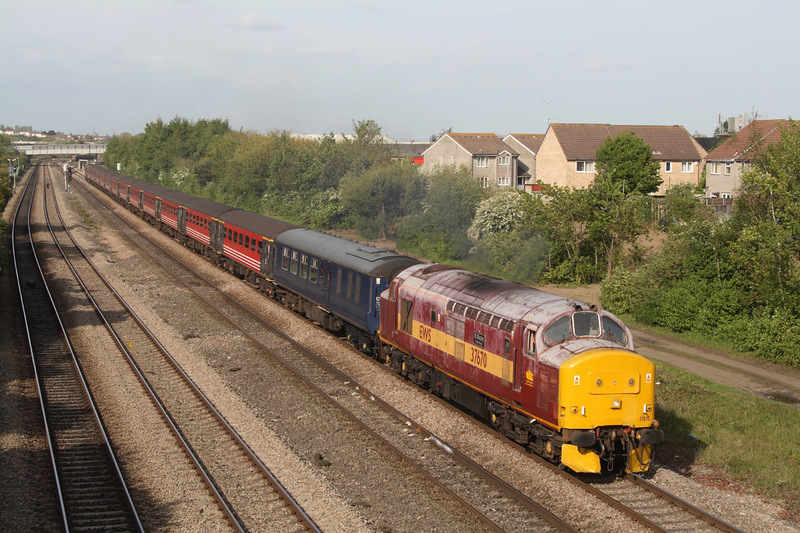 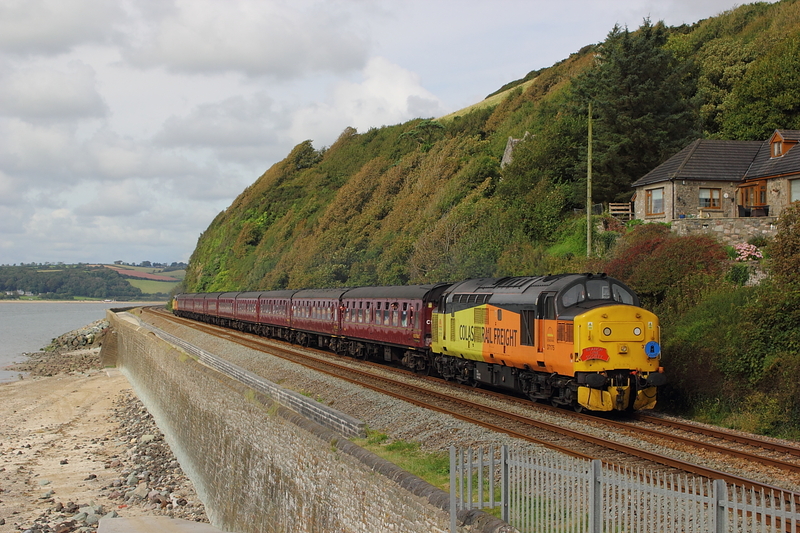 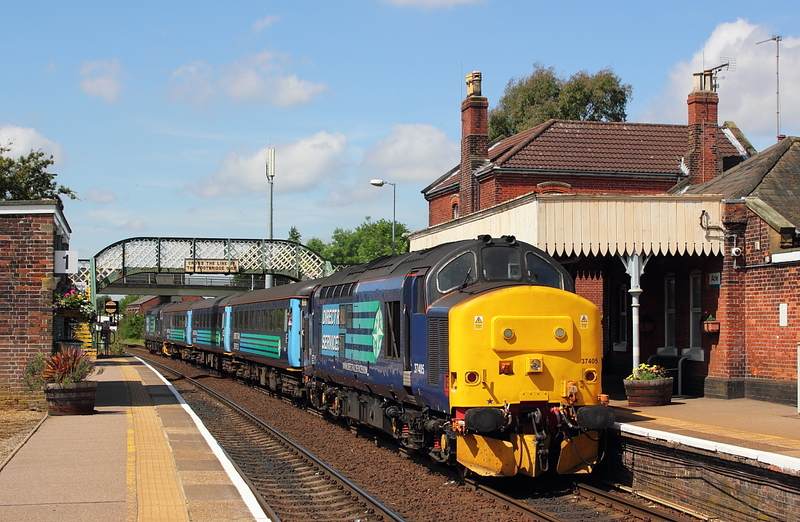 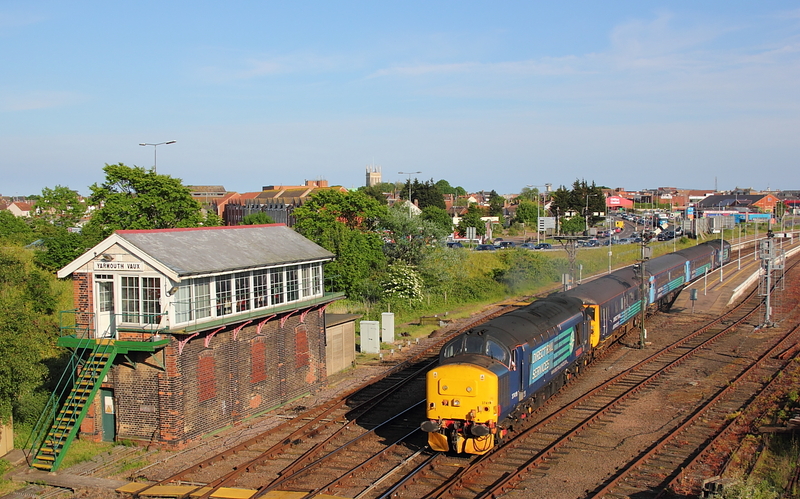 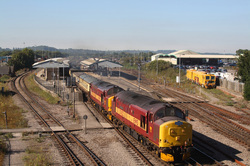 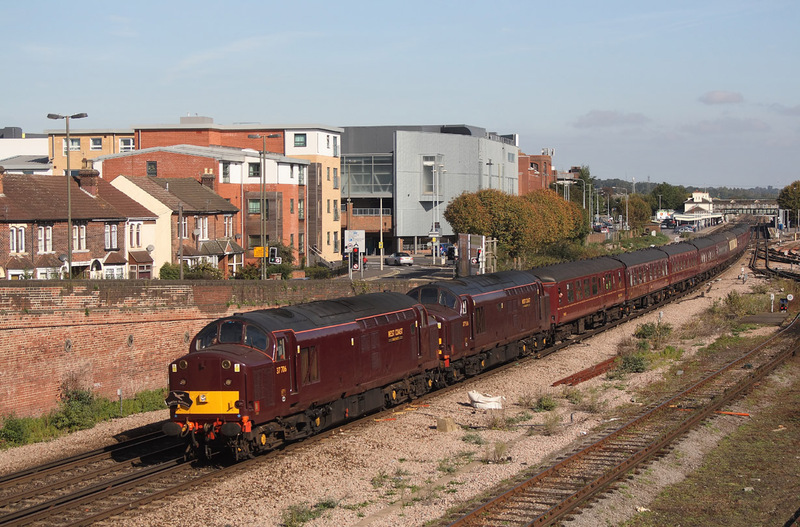 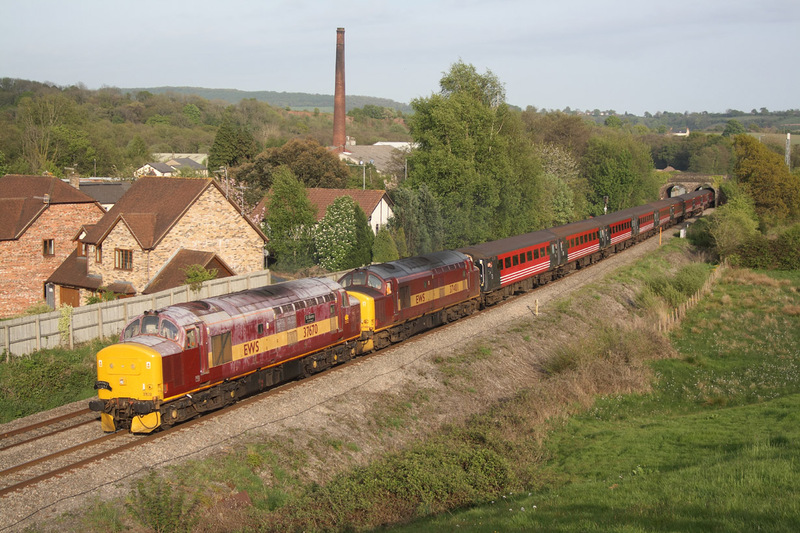 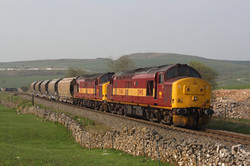 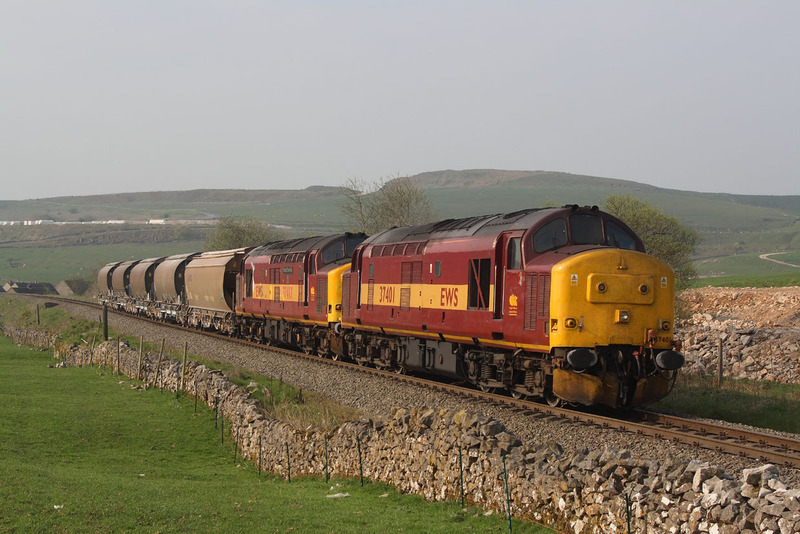 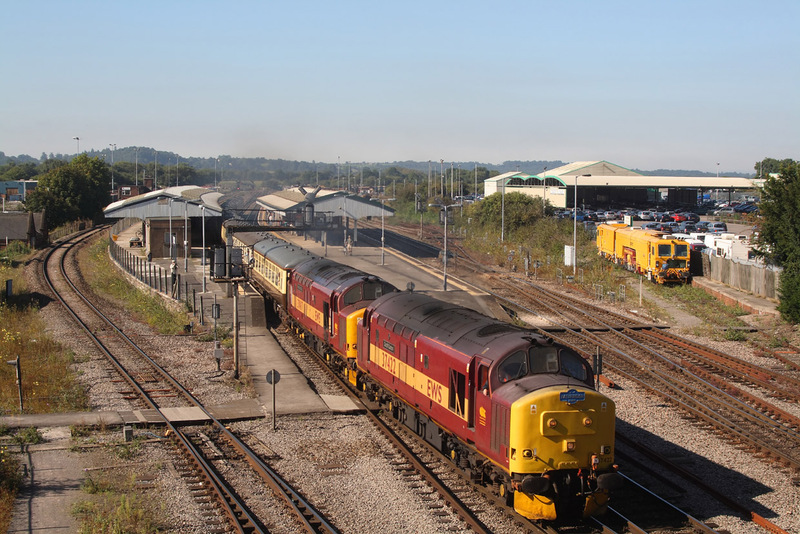 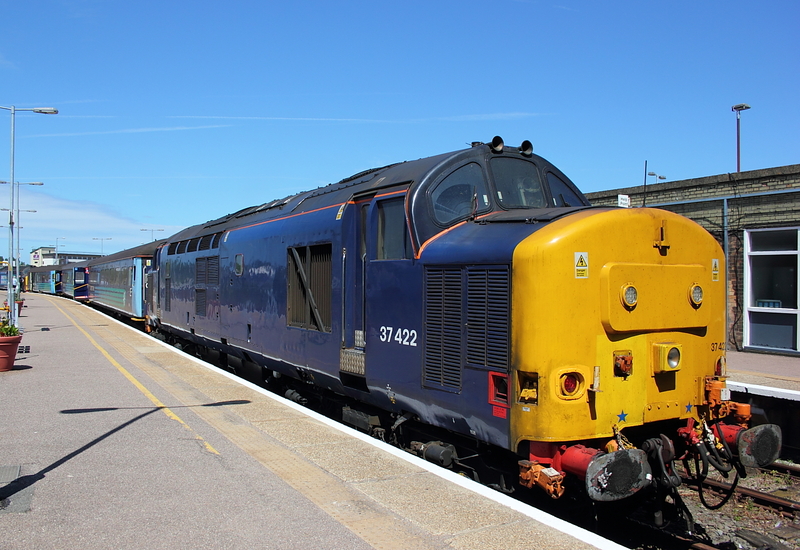 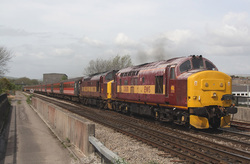 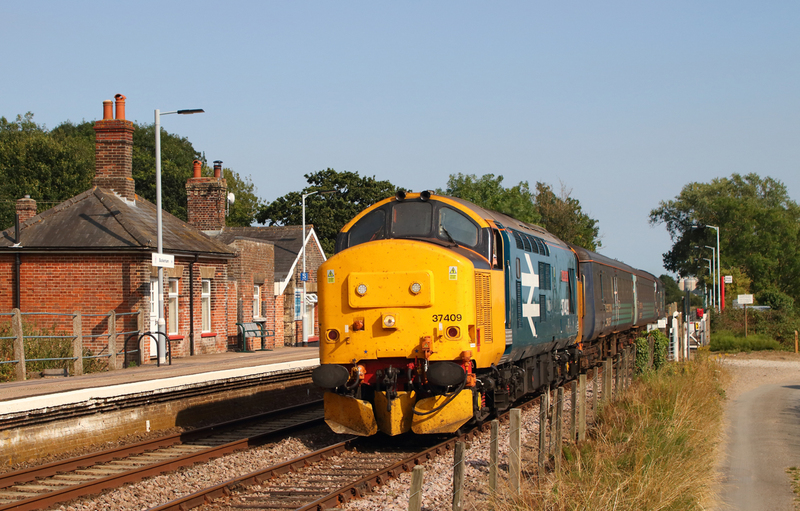 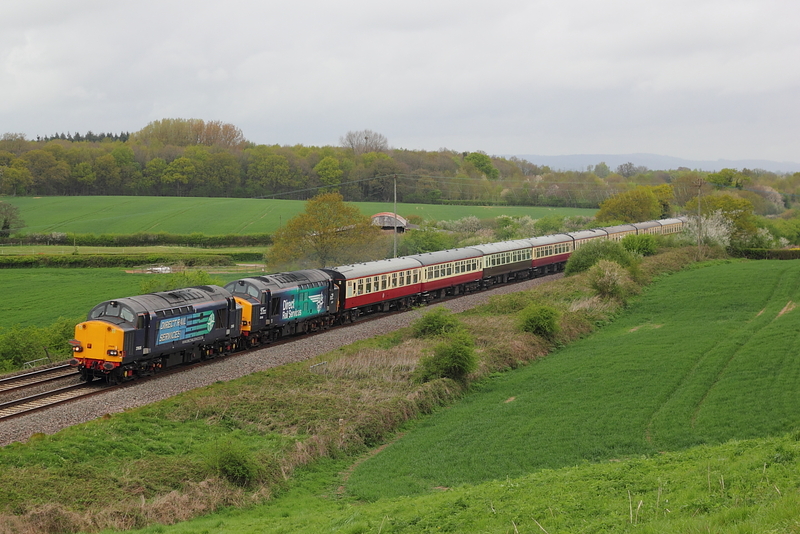 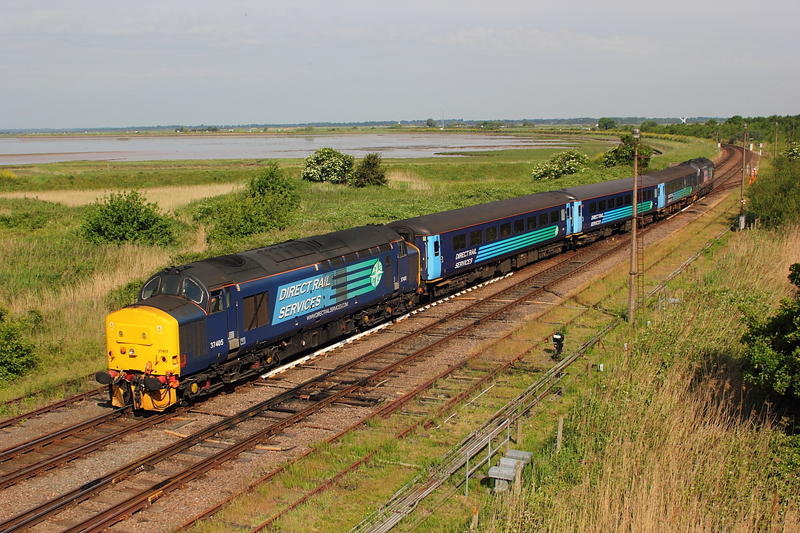 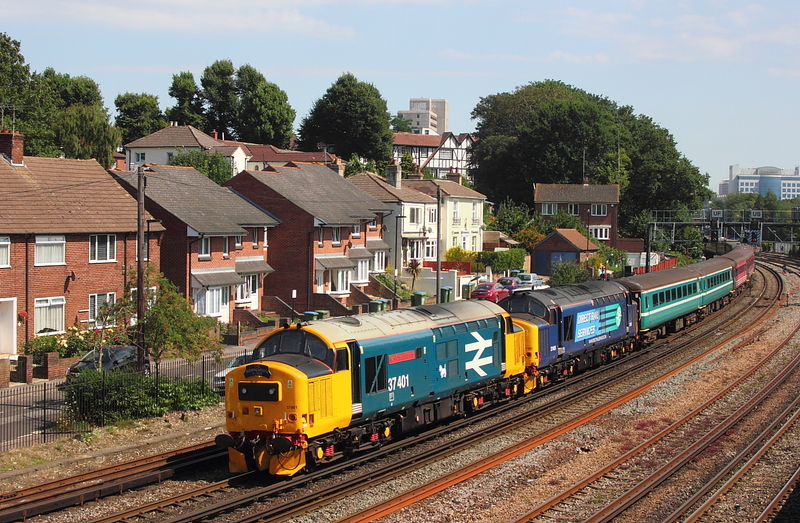 37069+37602..1Z45..16.36 ,Spitfire Tours,Weymouth to Crewe tour. 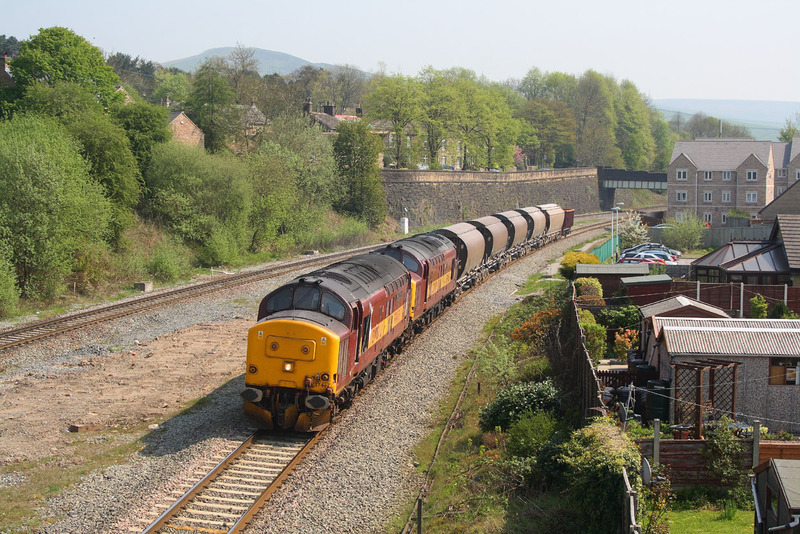 37670"St.Blazey Depot"+37401..1Z52..18.04 Cardiff Central to Mossley Hill,the returning Heart of Wales Scenic Railtour. 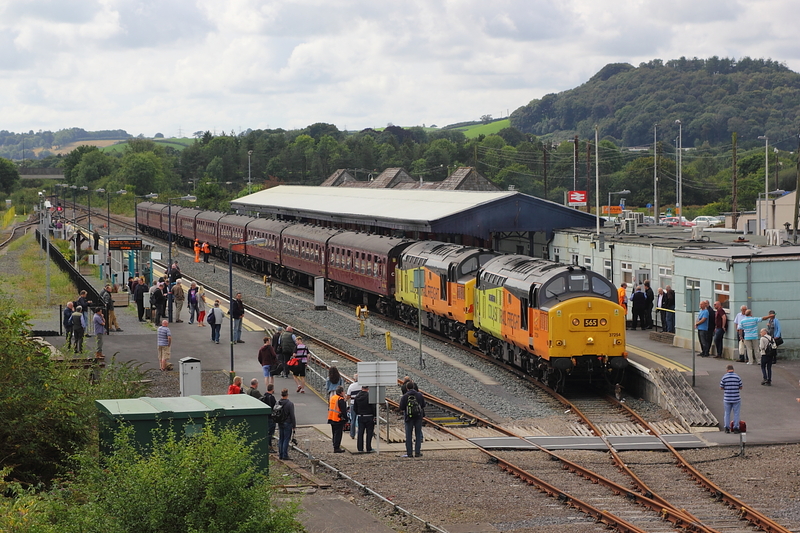 37670"St.Blazey Depot" and 37401 on the rear of the ECS to Cardiff Central,then forming 1Z52,the 18.04 Heart of Wales Scenic Railtour back to Mossley Hill. 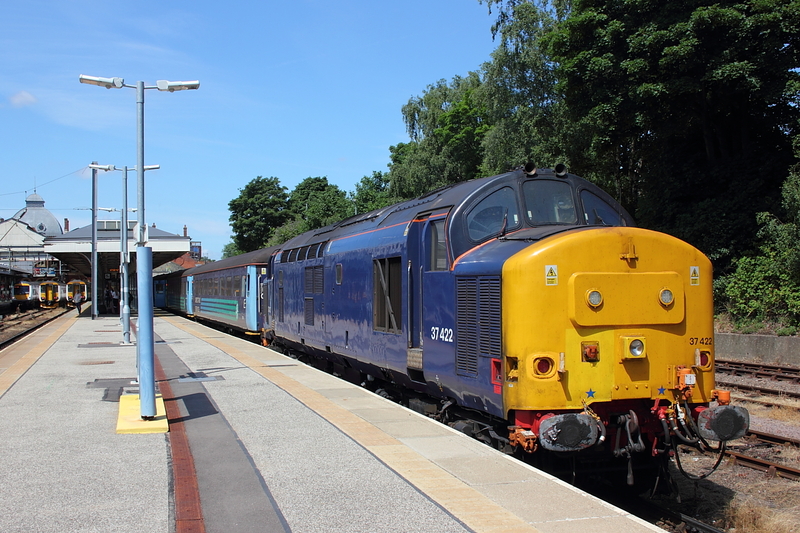 37670"St.Blazey Depot+37401..1Z51..07.13 Mossley Hill to Cardiff,The Heart of Wales Scenic Railtour. 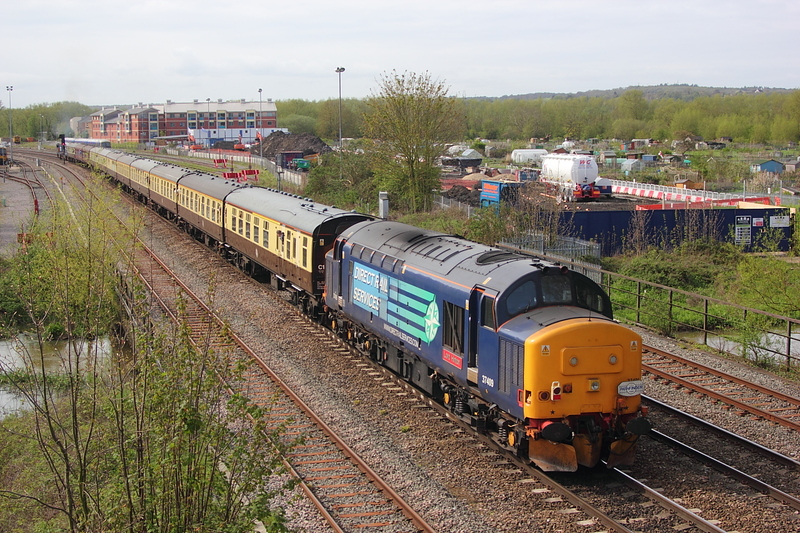 37717"Richard Trevithick" 6M58 Southampton West Docks to Bescot cars. 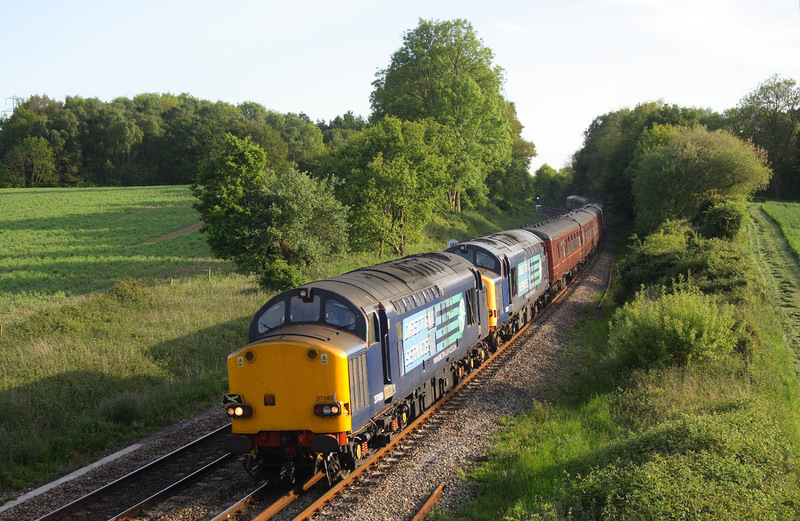 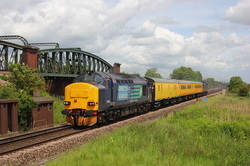 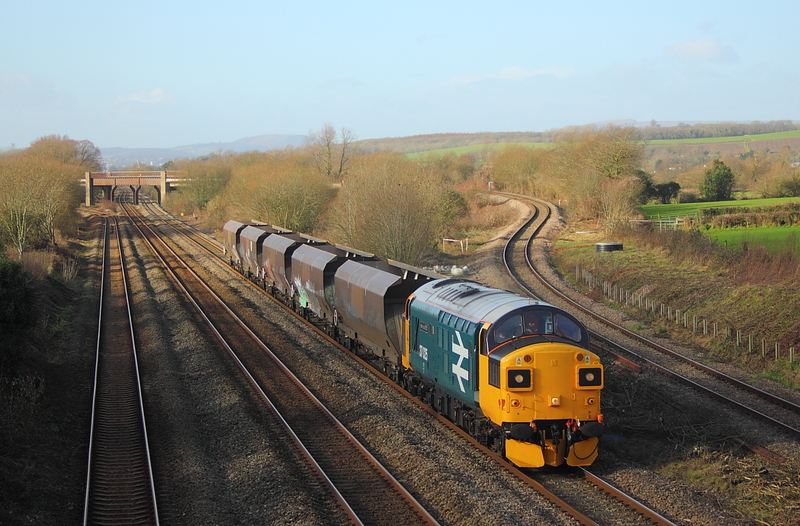 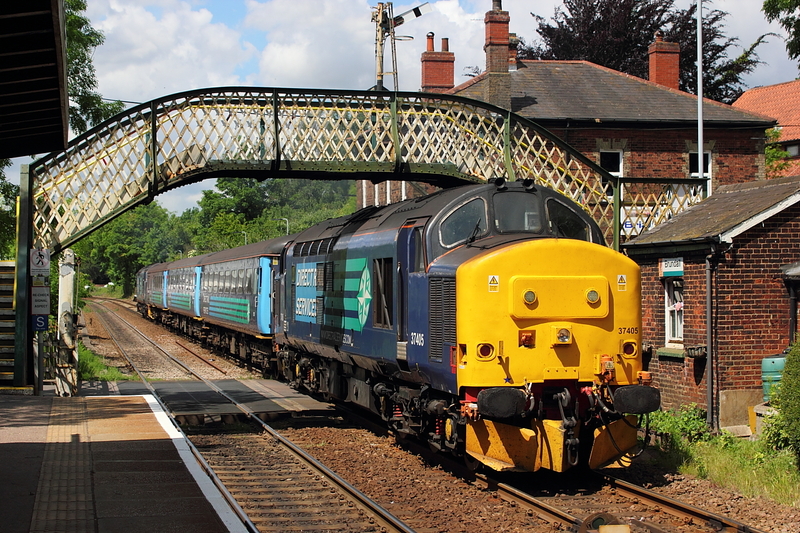 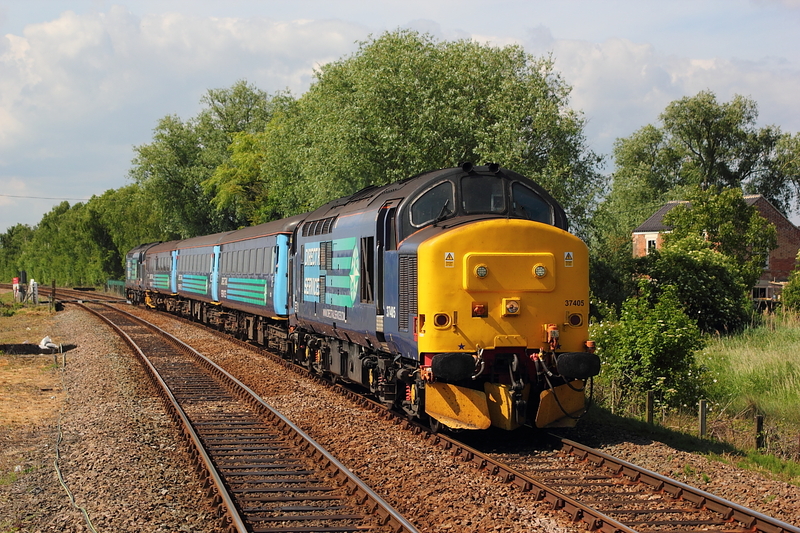 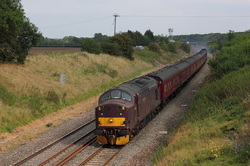 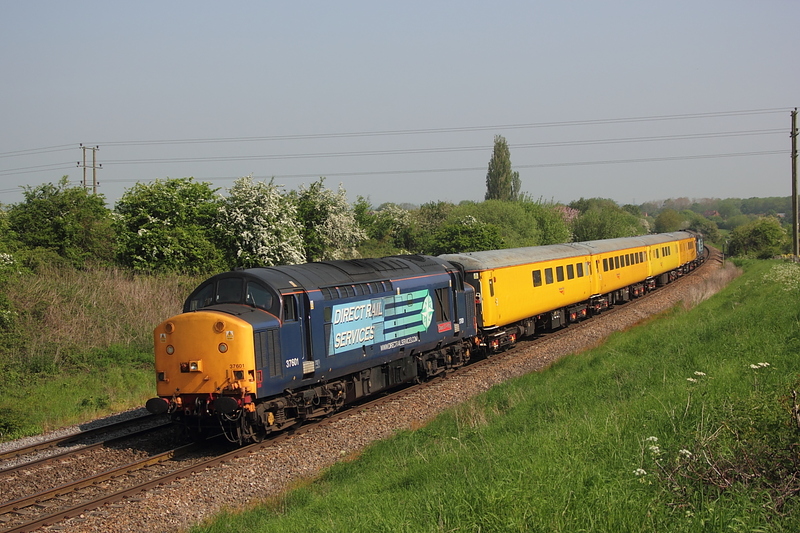 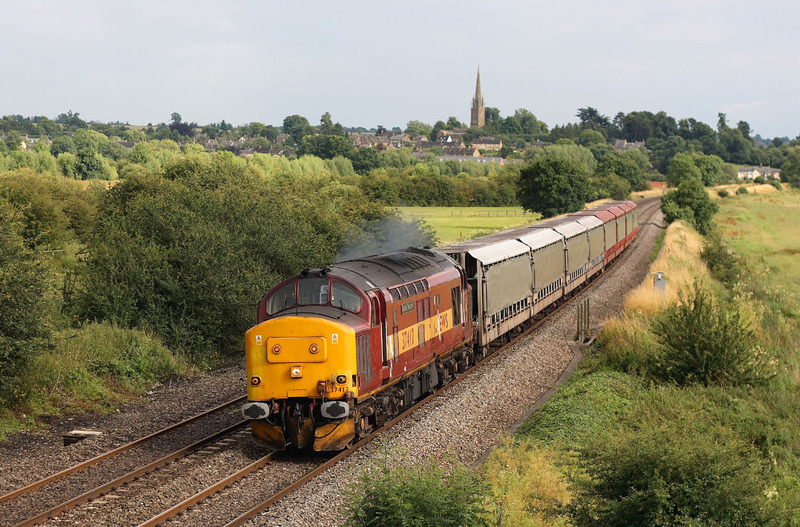 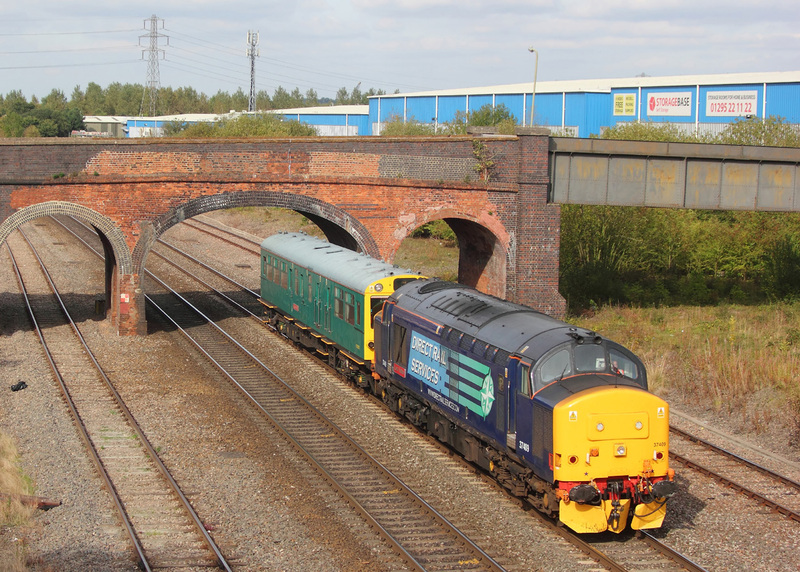 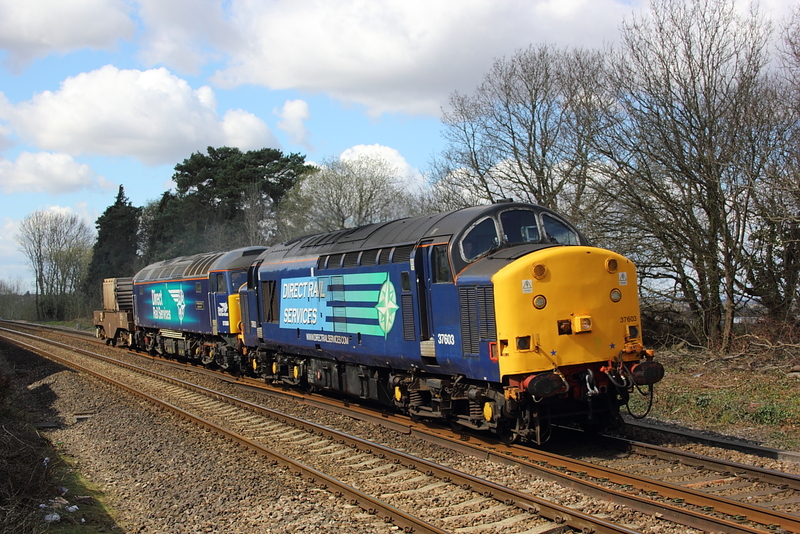 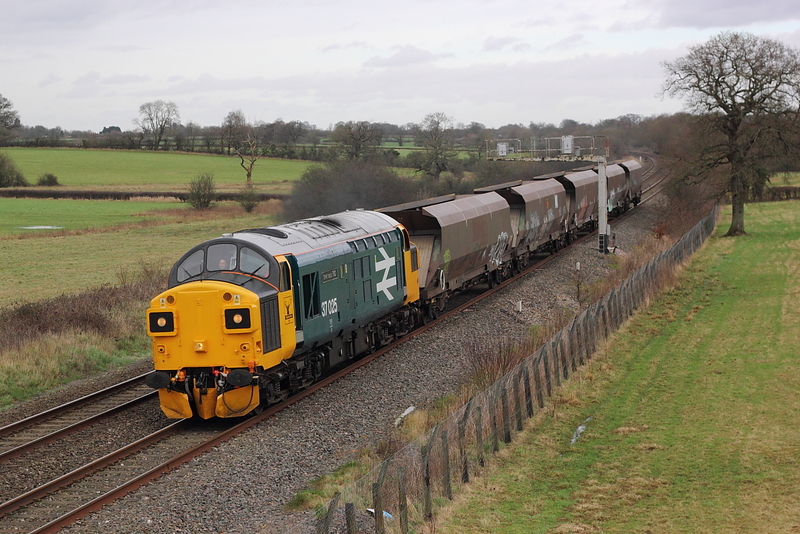 37417"Richard Trevithick"+37401..6F67 Dowlow to Warrington Arpley enterprise. 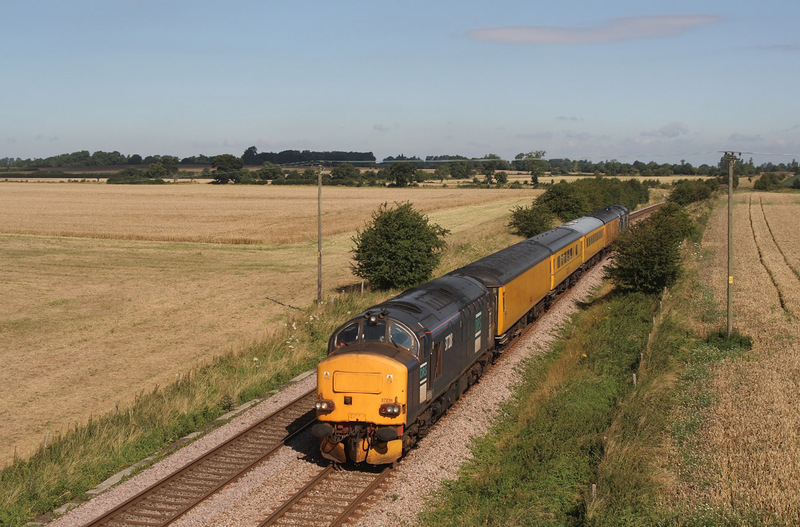 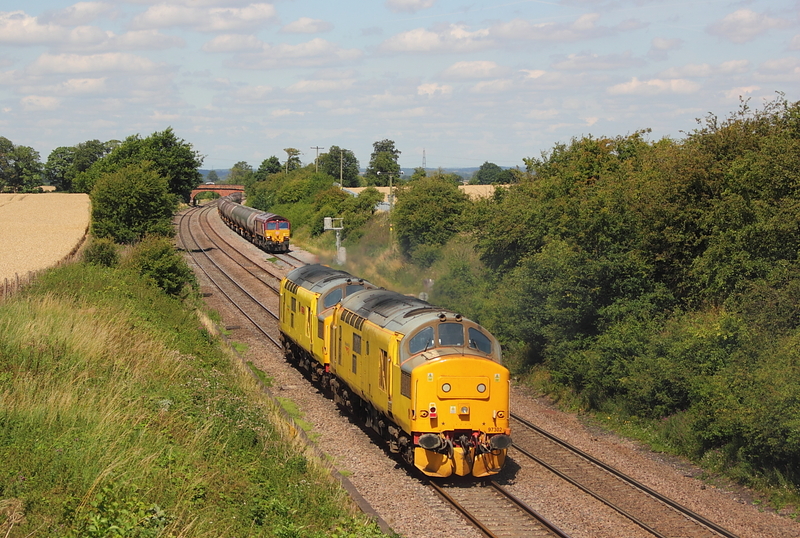 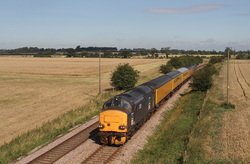 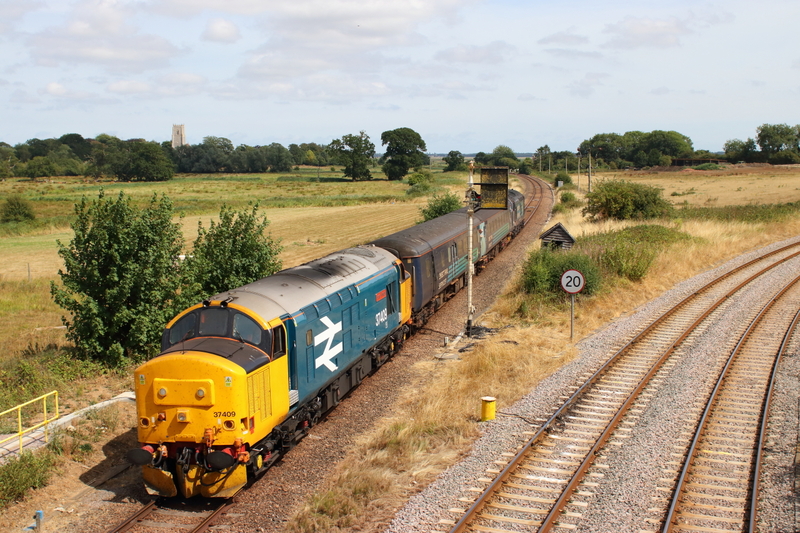 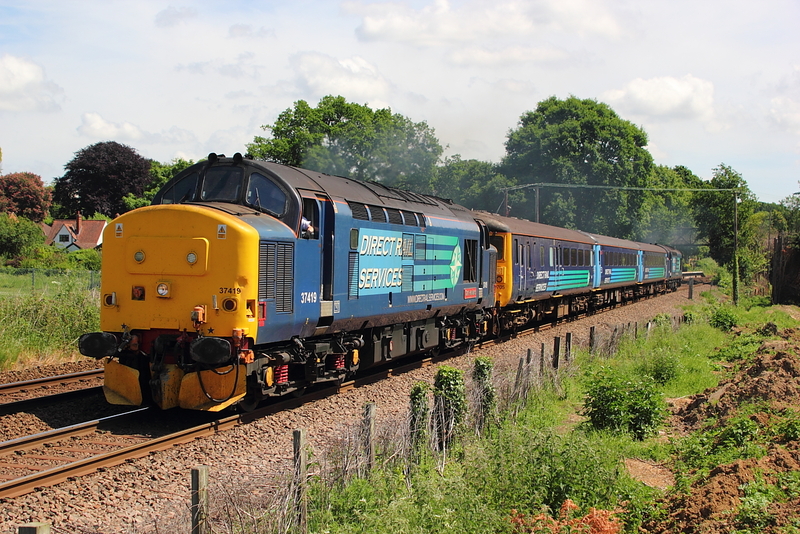 37401+37417"Richard Trevithick" 6F67 Dowlow to Warrington Arpley enterprise. 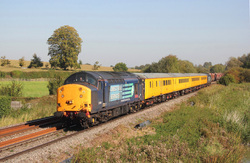 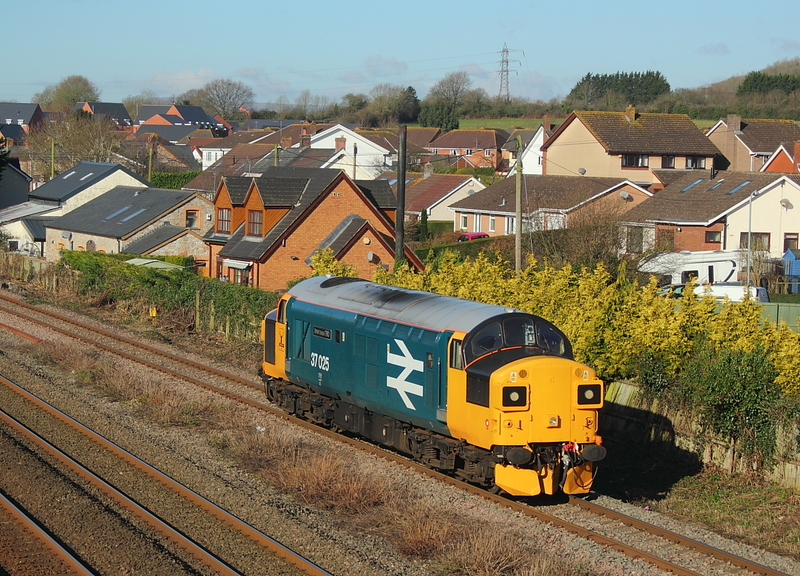 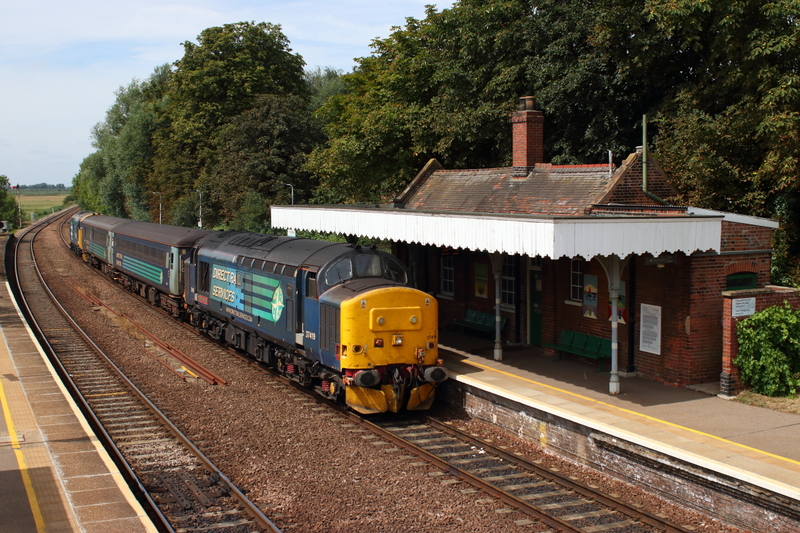 37422+37417..1z37..09.10 Eastleigh to Llanndrindod Wells,The Heart of Wales Explorer. 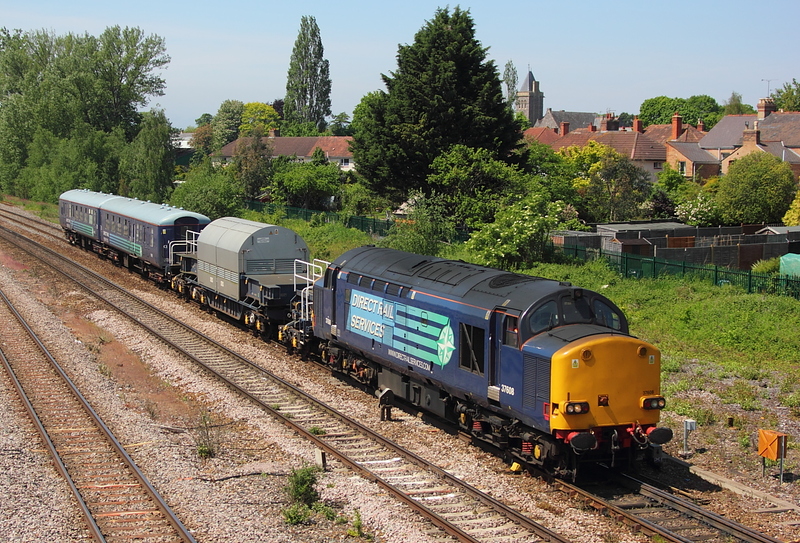 37218 lading 37259 on the rear of the Westbury to Eastleigh surco,via Weymouth.